Folding@home is a distributed computing project based at the world-renowned Stanford University in the USA and is used by research scientists to run medical simulations in order to work out how and why proteins (one of the building blocks of life) fold. Folding is the medical term for the process proteins undergo when they interact with each other. Many diseases, such as Alzheimer’s and Mad Cow Disease (BSE), are caused in part by proteins misfolding. You can find out more about folding@home in our recent feature, and find out how to configure folding on your PC in our recent our step by step installation. Although you can run folding on almost any CPU and many graphics hardware, if you want to make a major contribution towards medical science (and climb the leaderboards), you should think about building a dedicated folding rig. In this feature, we take a look at how to go about it, and which hardware is best for the job. The first aspect to consider is which client software your dedicated folding rig will run to generate the best return on investment, or in other words, which rig will produce the most points per pound you spend and per watt of power it uses. Stanford updates the folding points system on a regular basis; currently, the points system means that it makes more financial sense to build a rig with multiple graphics cards than one with multiple CPUs, or several PCs each running the SMP CPU client. The next decision to make is which graphics cards, other hardware and operating system to use. However, since building a multiple GPU folding rig is very different from building a gaming rig with multiple graphics cards, this isn’t a case of simply choosing the best products from our regular Buyer's Guides. For starters, although you’ll need a motherboard with multiple PCI-E slots, as each GPU runs an individual folding client, it isn’t necessary to buy a CrossFire or SLI-certified motherboard. In addition, because folding isn't as bandwidth intensive as gaming you can also run folding on a graphics card installed in PCI-E slot with eight PCI-E lanes or fewer without a loss in performance. This means that you have a far wider choice of motherboards from which to choose than if you were building a gaming rig. Ironically, this means that many motherboards overlooked by gamers are ideal for a dedicated folding rig. For example, although Socket AM2+ motherboards based on the AMD 790FX chipset aren’t the best choice for a gaming rig, many such motherboards have four 16x PCI-E slots, making them ideal for folding. 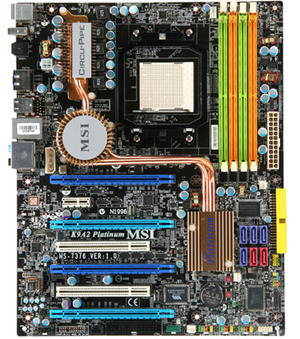 One such motherboard is the MSI K9A2 Platinum (pictured right), which is particularly suitable for a folding rig as it has sufficient space to house four dual-slot graphics cards (with the fourth card hanging off the edge of the PCB). While some LGA775 and LGA1366 motherboards can house several graphics cards, the K9A2 Platinum is much cheaper, retailing for around £106, leaving you more money to spend on the graphics cards. If you're rather use a more modern motherboard then the awesome MSI 790FX-GD70 is also worth considering, although it costs close to £142. As CPU performance isn’t critical to the folding GPU client, you can also get away with using a cheaper CPU. 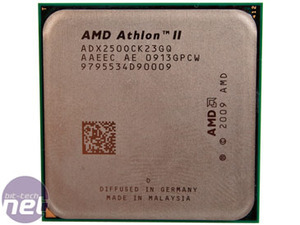 Continuing with the example of the K9A2 Platinum previously mentioned, we’d recommend one of the cheaper models of the Athlon II X2 series. Despite having only two cores, these CPUs are ideal for a multi-GPU folding rig, as they’re very cheap (around £56 for an Athlon II X2 250) and don’t consume much power. This means that both power usage and costs are kept down, while also minimising the temperature inside the case, which will prolong the life of all the components. However, if you're planning on installing more than three to four graphics cards (or cards with multiple-GPUs) you'll need a more powerful CPU. As a general rule of thumb, it's a good idea to work on the principal that each CPU core can power two GPUs, so an eight GPU system will require a quad-core CPU to run optimally.